The first installment in the paper doll series. Eventually, I managed to fill a lot of Sundays with these paper dolls. Nice one, Lazy Weekend Shaenon! Ha Ha! 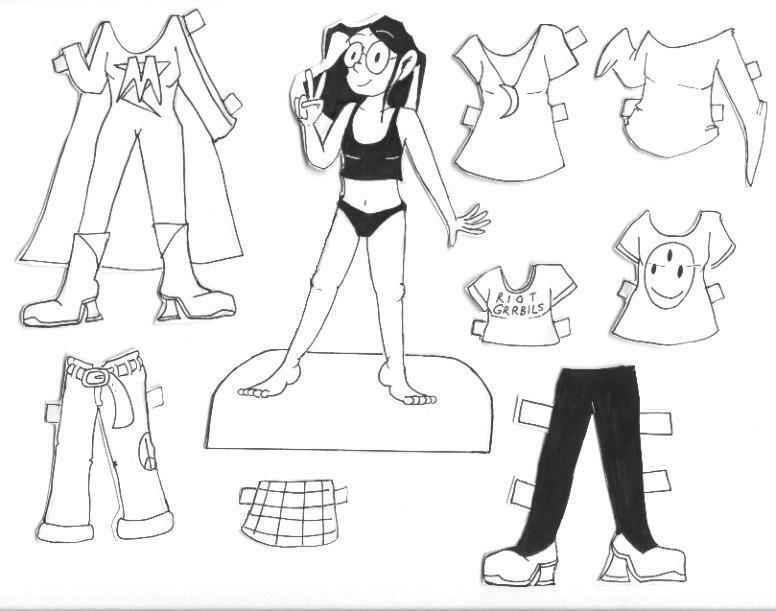 I made the paper doll clothes by tracing outfits over the drawing of Mell. Now that I have a lightbox, I could do it a lot more easily. At the time, the process involved a certain amount of guesswork. The dress with the moon necklace was Mell’s outfit when she was a character in my high-school comic strip, “North of Space.” The superhero outfit is there because I was planning to do a Sundays-only superhero story. Technically, of course, the characters would be supervillains. I decided to do the Victorian Sunday story first, and that ended up lasting through the entire run of Narbonic, so I never got to do the supervillain story. Aww, no superhero story?! Curse you, Jules Verne! It’s never too late for a Narbonic Superhero story, is it? Though, that didn’t work in the past….